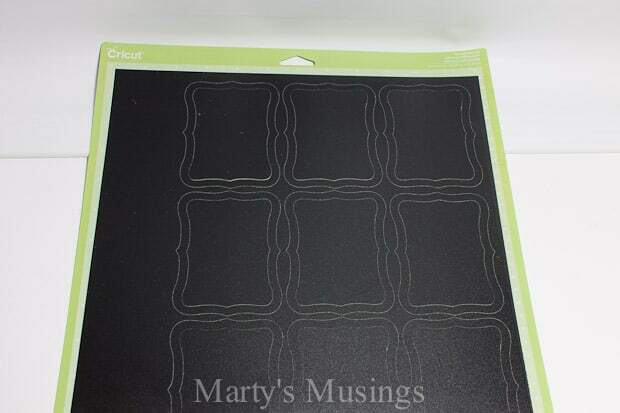 Make your own DIY chalkboard tags using scrapbook paper or spray paint. 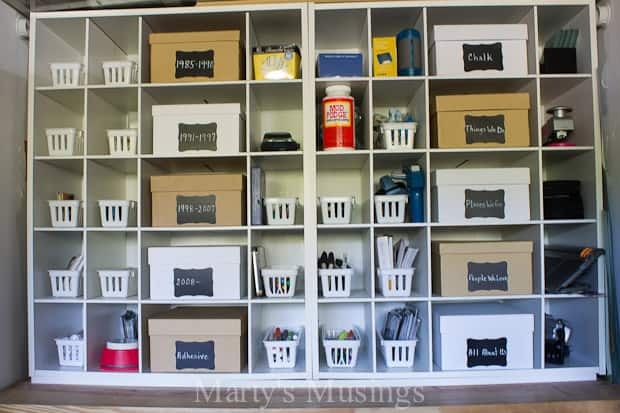 Easy way to organize every room in the house! 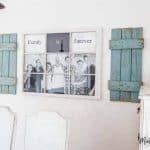 Using chalkboard as a decorative element in home decor has been the rage for a while. 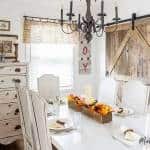 I am a total joiner with this trend and have incorporated it into several design elements in our home. 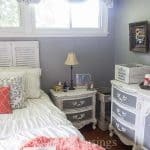 My DIY hubby threatened to quit making my “honey do” projects if I didn’t stop. 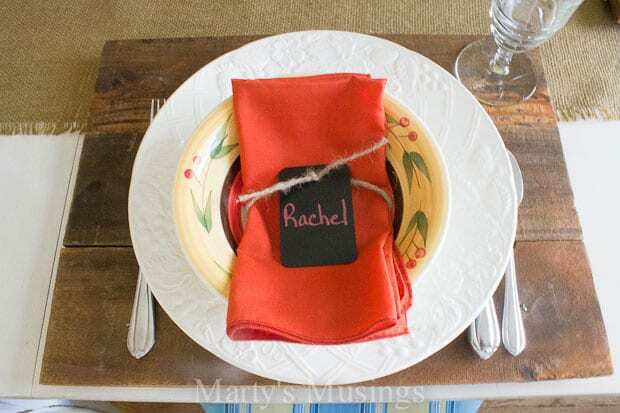 So I found a way to do them the inexpensive and easy way! 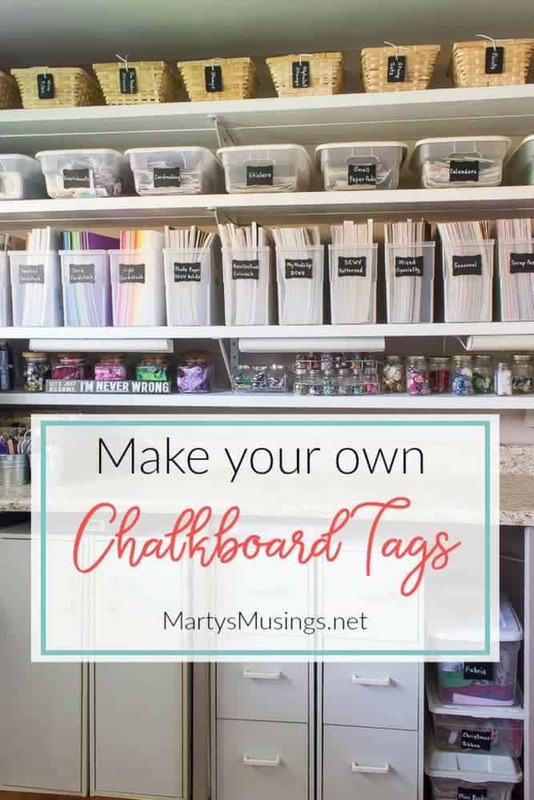 I love to organize and I’m on a kick to make my life easier and organize with DIY chalkboard tags. 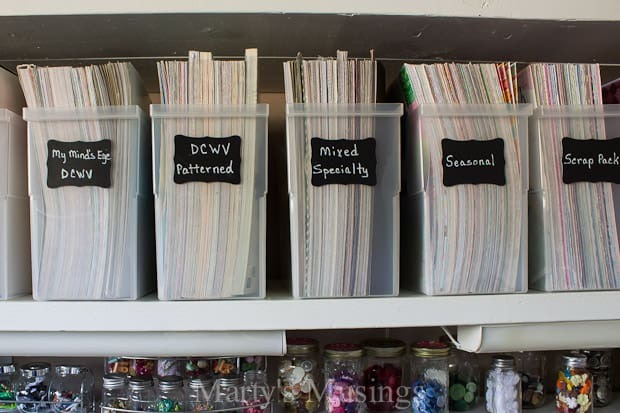 Have you seen my craft room makeover? 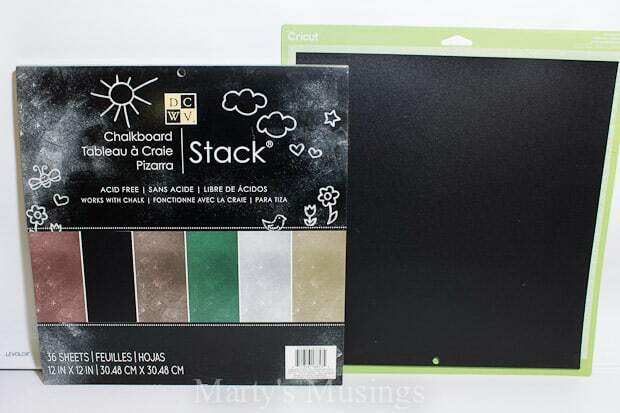 I totally went wild with chalkboard labels! 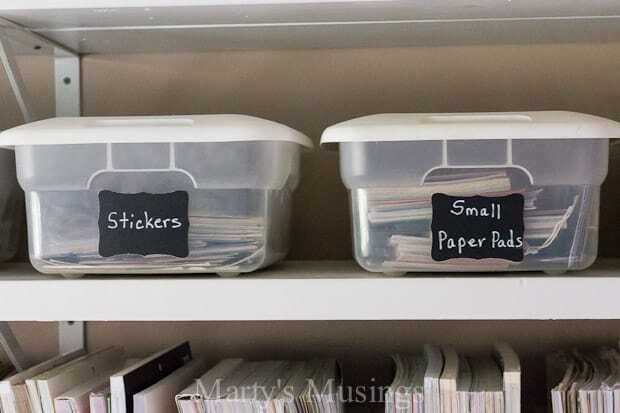 For the labels on all my craft storage I started with this cool Chalkboard cardstock by DCWV and my trusty Cricut diecutting machine. 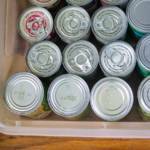 I used the Accent Essentials cartridge, setting #48 at 3″ in size. You can tell I cut nine frames out of one sheet of 12×12 paper. I was only interested in the inner cut of the frame for my labels. 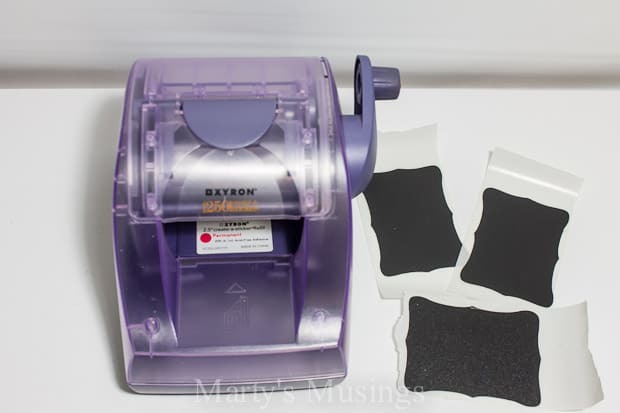 After I finished cutting I used my Xyron sticker machine to add a sticker to the back of each label. Then came the fun part! 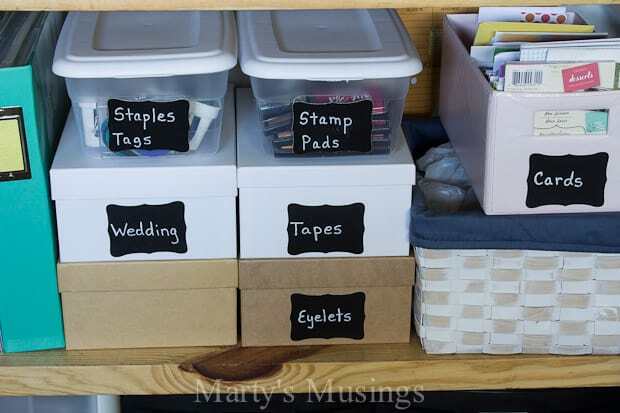 I used a white chalkboard marker and labeled my plastic file folder boxes for my scrapbook paper. 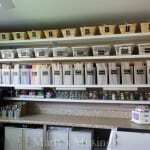 You can see my craft closet and all the cardboard boxes I labeled. The most brilliant idea? The boxes all came with the metal tag on the outside so I just turned them around and labeled the other side! 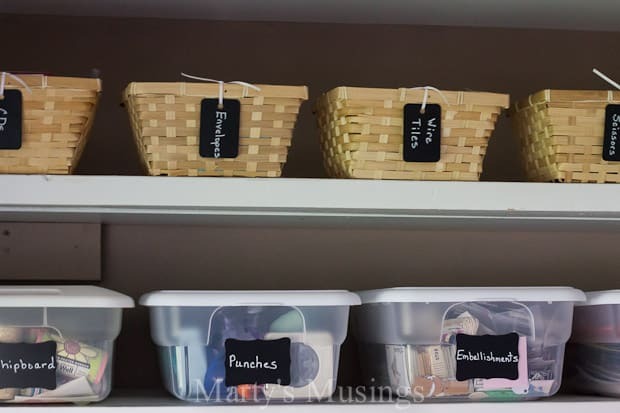 I used several dollar store containers and labeled those as well. 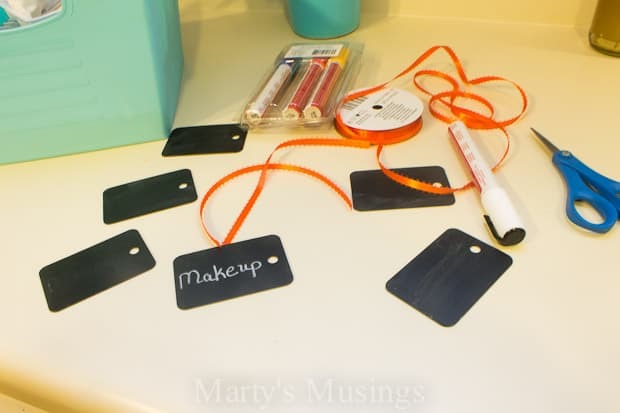 The second technique for DIY chalkboard tags is one I used in our small bathroom remodel. 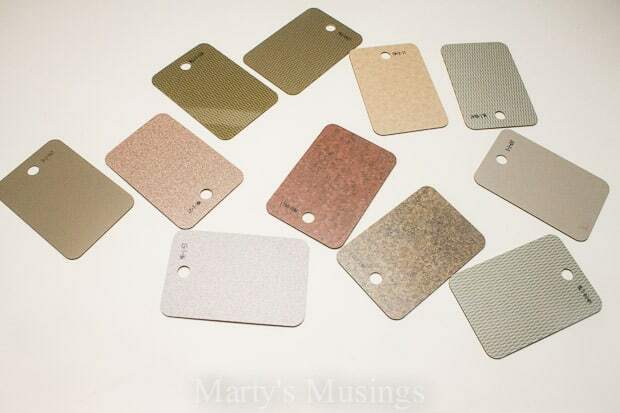 Someone must have sold countertops because these are like the samples you get at your local home improvement store. 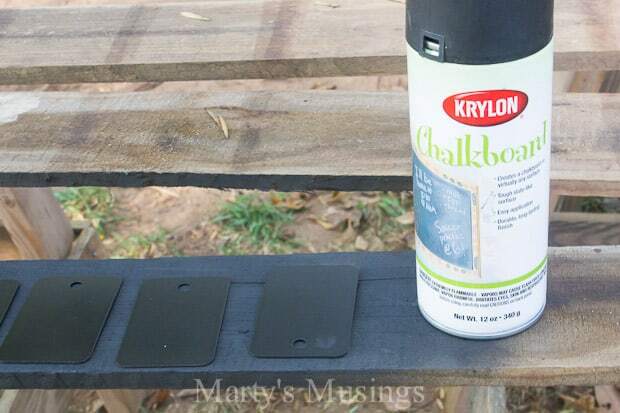 Krylon makes a terrific chalkboard spray paint and these tags got a couple of coats. 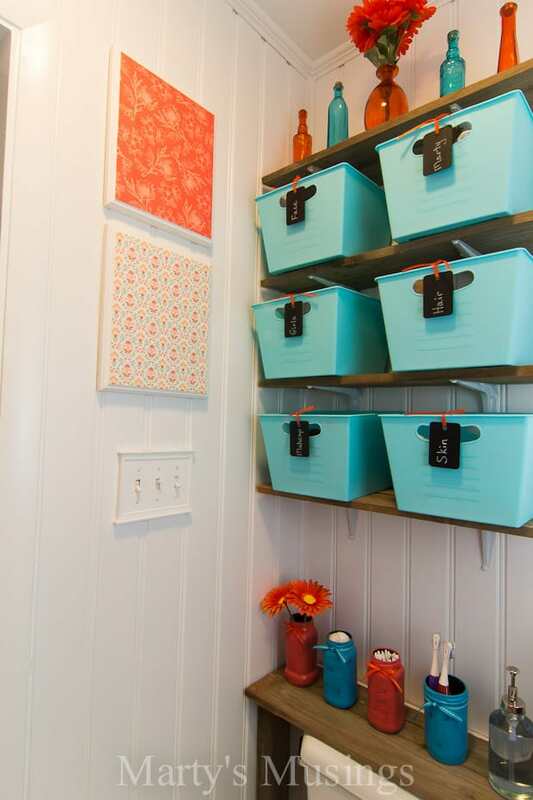 The hole at the top is perfect for coral ribbon to match my bathroom. 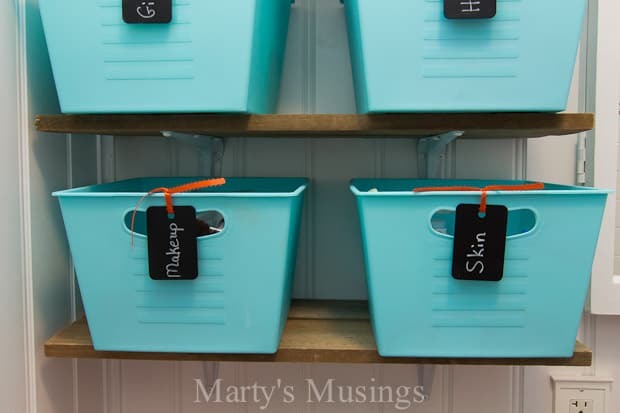 I love the look of these dollar store baskets with the chalkboard tags and ribbon. So what do you think? 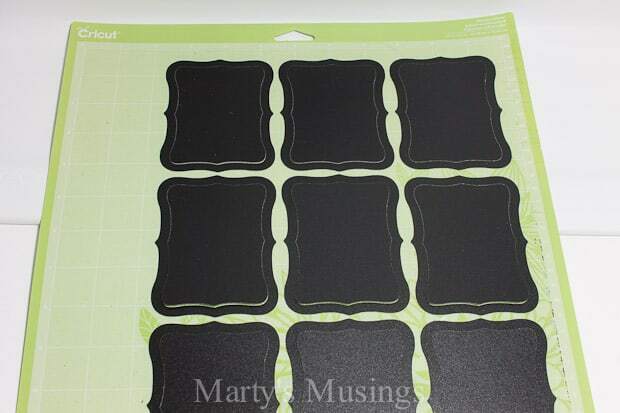 Do you have any areas that need sprucing up with some chalkboard labels? 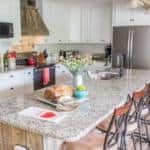 They are inexpensive and totally rockin’! 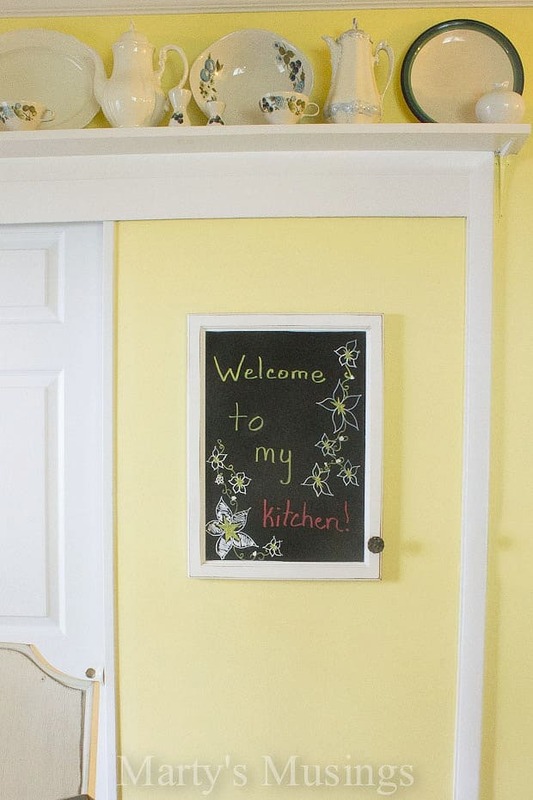 One of my first projects was this kitchen message board I made from chalkboard paint and an old medicine cabinet mirror. 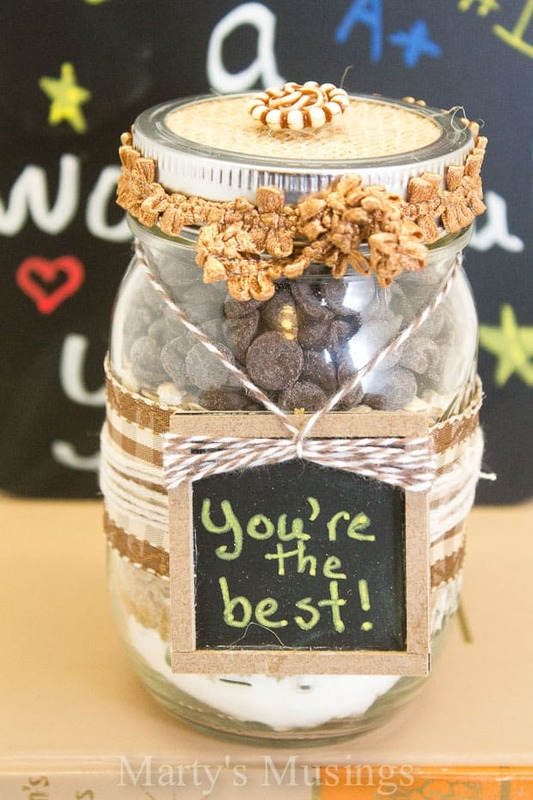 I even used mini chalkboards in this pint mason jar gift with a cookie mix inside.